Ok, my navigation has crapped out to where I get the green message to check my disc. I've seen other models for the '04 that can use the Metra kit, but I've been told my a Metra rep that it does not work for the model with navigation. Can others in the community tell me what my options are, beside sending my navigation off to Alpine for them to fix for $385? I don't mind spending $500 because that's a given now a days and I would really like to get a radio with bluetooth. If I fix my navigation, I get my 9 year old radio which, for that money, I want more. I see on Amazon that there are some off the wall name brand choices, but they don't get very good reviews and I'm leary of putting that kind of money into something that doesn't work properly. Any suggestions are very much appreciated. Last edited by T4 In Rockwall; 11-30-2013 at 12:05 AM. did you talk to someone at metra, or a local metra dealer? from all of the images I am seeing online it looks like it would fit. I do see online where it says its for the accord w/o navigation though. you could measure the screen you currently have and then modify the factory kit to fit an aftermarket. Last edited by neophyte; 11-30-2013 at 06:34 AM. i agree that moving to an aftermarket unit is a good idea. $500 won't get you built-in navigation though. 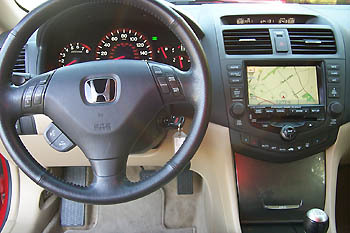 the concern may be that the thin LCD display provided with the navigation product is missing with non-navigaion models. the Metra 99-7803 kit is not compatible with the remote display. Maybe the physical fitment is good, but functionality is not. or maybe you just lose the screen but the function of the A/C controls is good. I think that's the question to ask. unfortunately, this level of head unit integration is becoming more common. I've had two email conversations with this rep and he said it's not compatible specifically because they've never found an Accord with navigation to try it on. Strange that this is the reason. Either way, I'd like to get some confirmation from others who have possibly used the Metra kit with an Accord with navigation to verify for me. I agree, the images look pretty convincing. Would you have a suggestion for an aftermarket unit? And also, what do you mean by the remote display? Basically the Metra unit is just a unit that will make my climate control work and give a space for a double din unit. It won't have anything to do with the unit that I put in there. Which is why I'm confused why this wouldn't work with an Accord with navigation. It should have nothing to do with anything except the climate control...unless I'm missing something. he is talking about the lcd screen above the vents. that is not present in the non navi ones. he is saying you may loose that function. as in you would just have a blank screen above your vents. Gotcha. That is a small price to give up for getting back my touch screen with something that will work. Thanks for the clarification. Maybe I'm asking the wrong question. Maybe my question should be if the Ex model and the Dx model have the same exact wiring harness for the dual climate control? The Metra unit I'm looking to buy has only been verified for the Dx apparently. Can someone on these forums verify this for me? I'll check with a dealership, but I believe there is more knowledge in this forum than I'll find at a dealership. Thanks for any help. I believe my car is the EX but I dont have the navi (03). it has every other option that was available for the car. I know that when I bought my harness it was just a generic 7th gen harness. The car has no markings on it as to which model it is and I bought it used, so I have never taken the time to find out for sure, I just assumed because of the dual climate control, heated seats, leather, sun roof, etc it was the ex, but that may not be the case. The type of climate control you have does matter as far as control. I agree the EX will be the fully loaded model, which it sounds like you have. also, there would be an EX decal on the rear corner.